OpenSkies Airline operated its first flight from Paris Orly to New York JFK on the 19th June 2008. OpenSkies Airline is a wholly owned subsidiary of British Airways (BA calls it "an airline within an airline"). This is the first long-haul British Airways flights from Europe other than from London Gatwick, London Heathrow (and to a lessor extent Manchester airport). OpenSkies Airline was initially mulling over whether they would first operate daily flights from Paris Charles de Gaulle (France) to New York and back, or from Brussels (Belgium) to New York and back. Eventually they settled on starting with flights from Paris Orly to New York (the plan is to add the Brussels-New York at the end of 2009). The New York - Paris flight route places Openskies in direct competition with Air France (Air France is opening a flight route from London to Los Angeles at the end of March, encroaching on British Airways' hometurf) and L'Avion which operates all-business-class flights. From 15 October 2008, Openskies will be operating flights between Amsterdam and New York. Openskies plans to operate flights between Brussels and New York from the end of 2009. Openskies settles on New York JFK? It took a while for Openskies to decide whether to fly from New York's JFK airport or New York Newark Liberty International airport - landing and takeoff slots had been secured at Newark Airport, but OpenSkies prefered New York's JFK airport. The complication with using New York's JFK Airport was the United States Department of Transportation's 2007 decision to cap flights into and out of JFK to 82 or 83 flights per peak hour. Later, OpenSkies are looking at adding flights to Madrid, Amsterdam, Frankfurt, Milan, and Zurich (although there may be complications with Zurich, as it is not part of the European Union), and on the United States side flights from Washington, Boston and Philadelphia. Initially, OpenSkies will begin operating flights with a Boeing 757-200, and they plan to add a second Boeing 757 towards the end of 2008. During 2009 OpenSkies plans to obtain the use of a further four Boeing 757s. From 1 October 2008 Openskies plans on having an all business class configuration in their plans, with 40 premium economy and 24 business class seats. This is in line with the original plane to offer a business class only service, which subsequently changed to setting the Boeing 757s in a 2-class configuration, but the demand for World Traveller Plus was so strong, that they decided to set up a 3-class configuration. The Boeing 757s were set up with 30 economy class seats, 28 premium economy seats and 24 business class seats that converted into 2 metre long flat beds (i.e. a total of 82 passengers). The flat beds are the old-style 'Dusk flatbeds'. With the demand for premium class flights between Europe and the USA having grown at an annualisedrate of 20% from 2004 to 2007. it is not surprising that Openskies are providing only 30 economy class seats. According to Willie Walsh the " 757 is not the perfect aircraft [to operate transatlantic flights with] but it will compete well [with United States airliners]." 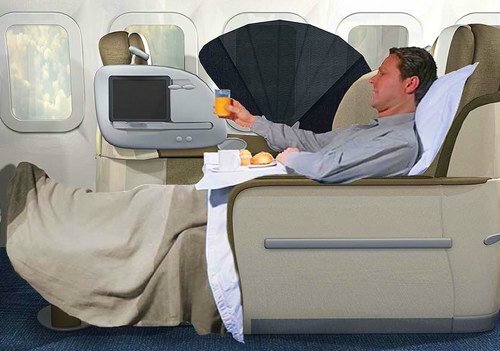 OpenSkies call their business class "Biz". 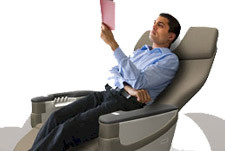 Each business class seat has its own on-demand flight entertainment system. An a la carte menu is offered. All the Boeing 757 aircraft will be drawn from British Airways' fleet, and will be retrofitted with "winglets" to reduce carbon dioxide emissions increase flight range and improve fuel efficiency. OpenSkies Airline's website is at www.flyopenskies.com. OpenSkies is considering an all-organic foods menu. During 2007 the European Union and the USA finalised an "open skies" treaty, and OpenSkies airline aptly derives its name from this agreement (although it is an industry first for an airline to name itself after an international treaty). Before the open skies agreement, European airlines were only able to fly to the USA from their home country. Only Virgin Atlantic Airways, British Airways, American Airlines and United Airlines were allowed to fly between London Heathrow and New York. In terms of the USA-European Union open skies agreement, European airlines may fly to the USA from any airport in the European Union from the 30th March 2008. "By naming the airline OpenSkies, we're celebrating the first major step in 60 years towards a liberalised US/EU aviation market which means we can fly between any US and EU destination...It also signals our determination to lobby for further liberalisation in this market when talks between the EU and US take place later this year." Willie Walsh, BA's chief executive. The further liberalisation which Walsh talks about is for the USA to relax foreign ownership of airlines and to allow European airlines to compete in the USA's domestic market. Initially the plan had been to remain with the name British Airways unless somebody came up with a spectacularly good name...and along came OpenSkies. By choosing a name neutral to nationalities, British Airways are warding off a thorny cultural issue - French, Germans and Italians may be more comfortable in flying with an airline called "OpenSkies" than one called "British Airways". British Airways wants to pay lower salaries and have more flexible labour conditions for OpenSkies Airline (i.e. it's easy to hire and fire), which the British Airways pilots aren't happy with - on the 9th January 2008 general secretary of the British Air Line Pilots' Association (Jim McAuslan) said: "We have issues with BA on how the new service should be structured." OpenSkies plans to recruit cabin crew in the USA. British Airways insists that there wont be links between the seniority list for existing British Airways pilots and OpenSkies airline. OpenSkies Managing Director is Dale Moss (British Airways' former director of worldwide sales), a USA citizen (who is based in the USA), who headed up Project Lauren. Moss most recently served as Chief Operating Officer for Jet Airways in India. The board of directors includes Roger Maynard, Keith Williams and Robert Boyle. 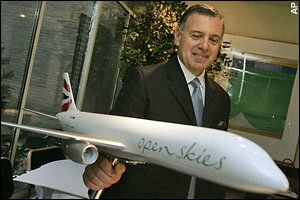 Willie Walsh, British Airways' chief executive, is not a director of BA European/ OpenSkies. OpenSkies must still obtain regulatory approval in the USA and United Kingdom. OpenSkies is the brandname under which the company, BA European Ltd, is operating. BA European Ltd is registered in the United Kingdom and is a subsidiary of British Airways. Openskies Airline plans on having removed all economy class seats, and going all-business class. BA purchases L'Avion, a French Airline operating flights between Paris Orly & New York, for 54 million pounds (purchase completed on 25 Jul 2008). The plan is to integrate the airline with OpenSkies in early 2009. Openskies flies its first flight from Paris Orly to New York JFK. Openskies starts selling tickets on its New York-Paris flight route, priced at some $1000 for economy class seats (return flight), $1500 for premium-economy seats and $3500 for business class seats. The UK's Civil Aviation Authority provides the clearance to Openskies to fly from Paris Orly Airport to New York JFK. Openskies decides to use Orlando-based Radixx International's flights reservations systems (online reservation system, telephonic reservations system and travel agent reservation system). Other airlines using Radixx's flight reservations systems are USA 3000 Airlines, North American Airlines, Air Iceland, Eurolines, Polynesian Airlines, Vintage Props & Jets, Robin Hood Aviation, Ghana International Airlines and Zambian Airways. Taxi New York announced that it has been chosen by Openskies for advertising services. British Airways pilots vote 86% in favour of strike action against British Airways, in protest against British Airways plans to use lower paid pilots from outside the group at OpenSkies. The pilots want one pilot community for both British Airways and OpenSkies. British Airways announces that the name of their new airline is OpenSkies Airline. News leaked out that British Airways was running a "Project Lauren", a plan to establish an airline to operate flights from continental Europe to the USA (Lauren is the first name of the first granddaughter of OpenSkies' Managing Director, Dale Moss). Adverts for pilots appear under the website, www.projectlauren.co.uk: "In anticipation of open skies, a major European flag carrier is offering the opportunity to be part of a team of professionals establishing a new concept scheduled carrier airline. Operating from US East Coast to Western Europe with B757 aircraft. Operations will commence in the summer of 2008. We are seeking Pilots to be based in Western Europe who meet the following criteria." The European Union and the USA conclude an open skies agreement, allowing European Airlines to fly to the USA from any airport in the European Union (prior to which only British Airways, Virgin Atlantic Airways, Delta Airways and American Airlines could operate direct flights between New York and London Heathrow). A preliminary accord is struck between the EU and the USA to allow expanded service to cities in the EU and the USA; including allowing European airlines to fly to the US from any city in the European Union (and vice versa).